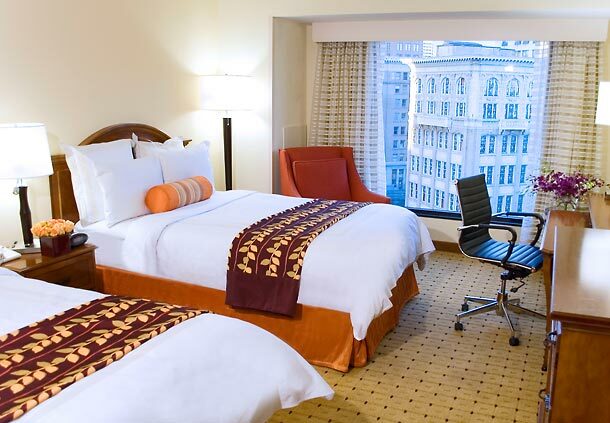 The official RBMS hotel is the Oakland Marriott City Center, 1001 Broadway, Oakland, CA, 94607. The hotel features spacious guest rooms with spectacular views of the San Francisco Bay and the Golden Gate Bridge. One of the most centrally located hotels in Oakland, the Oakland Marriott City Center allows guests to easily explore nearby Chinatown, museums, fine dining and trendy shopping at Jack London Square. Coined the Brooklyn by the Bay, Oakland boasts a thriving arts and food scene. Hop on the BART subway system across the street and be comfortably transported to all the attractions of downtown San Francisco in just 12 minutes. Please book early to secure the discounted group rates of $189 single/double. Complimentary high speed internet access is included. You can make hotel reservations online or call the Oakland Marriott City Center Reservations at (510) 451 – 4000, and mention the RBMS Conference to receive the discounted group rate. The discounted group rate is available on a first-come, first-served basis until Friday, May 22, 2013. A major credit card will be required to confirm your reservation. Hotel rooms are selling like hotcakes! 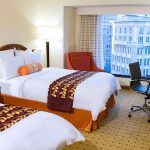 Not finding availability at the Oakland Marriott City Center? Not to worry. You might try Expedia or other search engine of your choice. Search near the Oakland Marriott City Center address “1001 Broadway, Oakland, CA, 94607”, then sort by distance. There are several affordable hotels nearby within easy walking distance. Dorm-style accommodations are available at the University of California, Berkeley. You can submit your reservation by printing the RBMSDormRegistration2015 (pdf) and faxing or mailing it in by June 5, 2015.